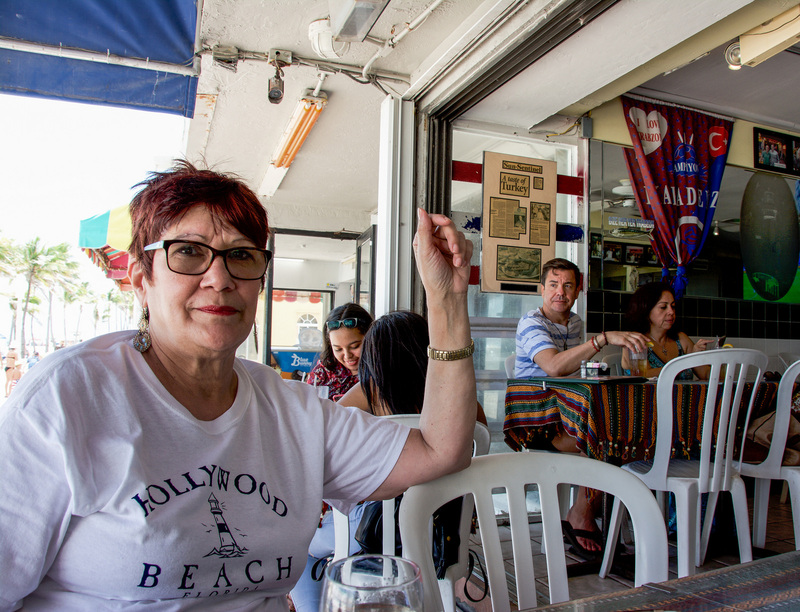 Miss N. was back in town, and this time we met her in Hollywood, at Istanbul Restaurant. It was recommended by Miss E. as she had been there before. 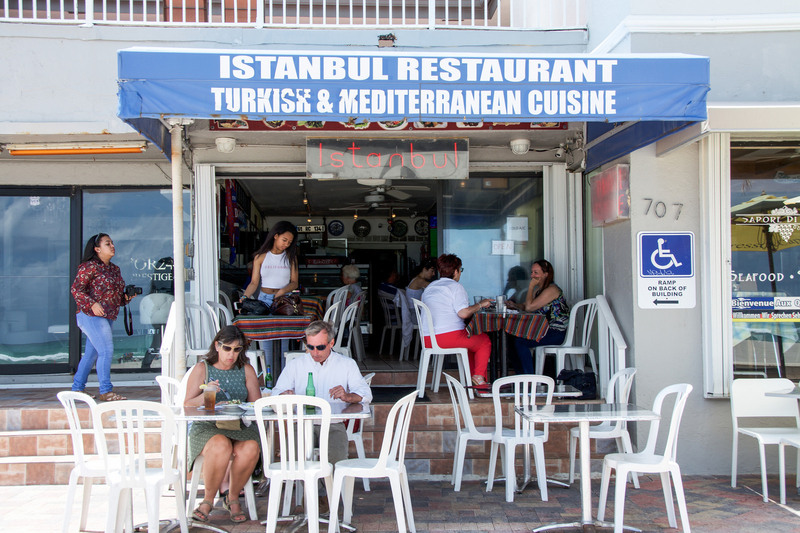 Turkish food had been a fascination, and this was a chance to try it while people-watching on the Hollywood Beach Broadwalk. 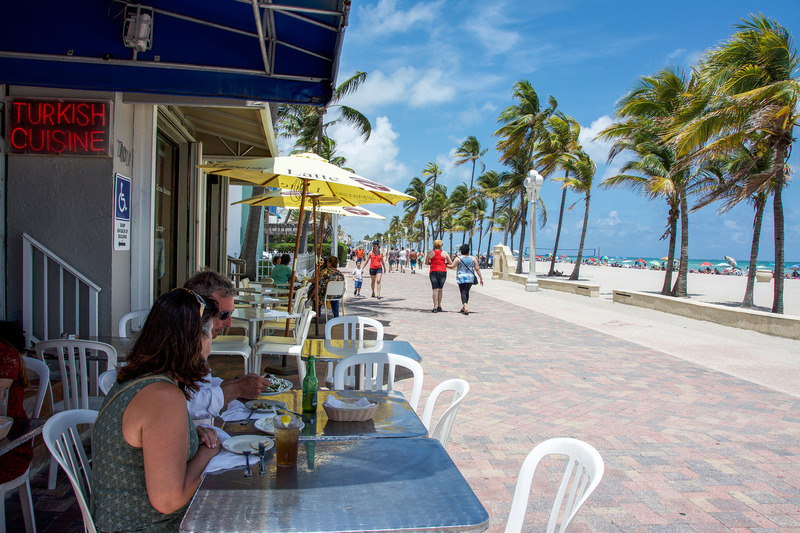 The restaurant was right on the promenade, and it was tiny, a couple of tables right on the sidewalk, some more inside. After we had parked, we got lost and started to walk in the opposite direction – this made us late, and Miss N. was growing increasingly impatient at our tardiness. I was becoming hotter and hotter as the sun was blazing, thank goodness for the ocean breeze coming from the beach. When we finally arrived, it was like coming to an oasis; I was grateful not only to sit but also for the delicious aromas emanating from the kitchen, only increasing our anticipation. For appetizers, we had a Soguk Mezeler, a combination platter of different cold dishes. Everything on the plate was vegetarian. 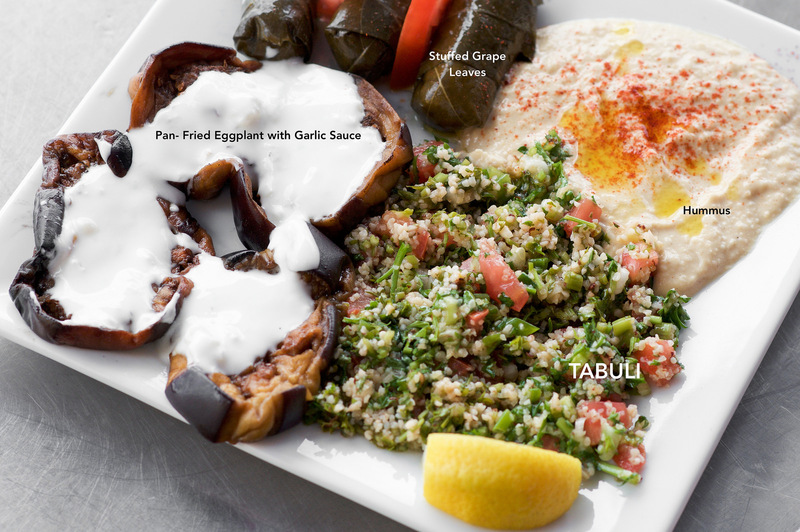 All of it was delicious – simple, straightforward flavors that managed to penetrate the very soul of the taste buds. The Turkish Salad ( Coban Salatasi) came next. Diced tomatoes, cucumbers, onions, green peppers, parsley and Turkish spices dressed with Turkish olive oil and vinegar. Garnished with grated feta cheese and a black olive. 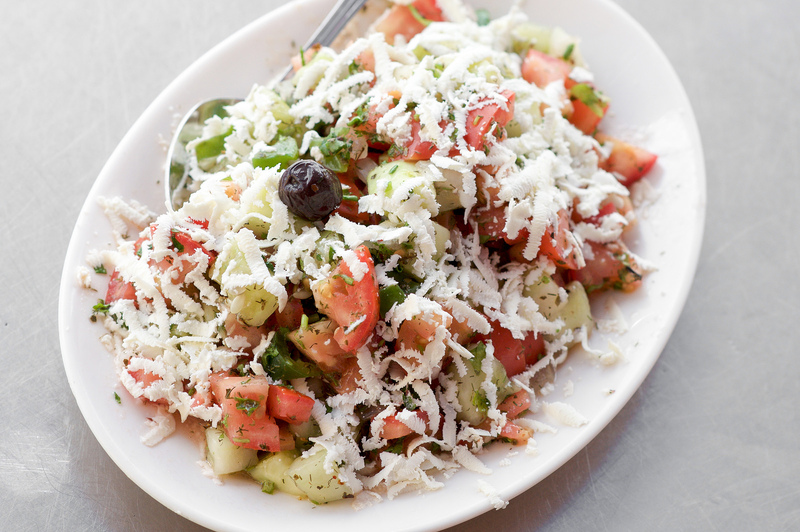 This very refreshing salad hit the spot. There is nothing more delightful than Chicken Pie, and this Turkish version was outstanding. This is the second dish that I have tried this year that gave culinary goosebumps to my tongue. 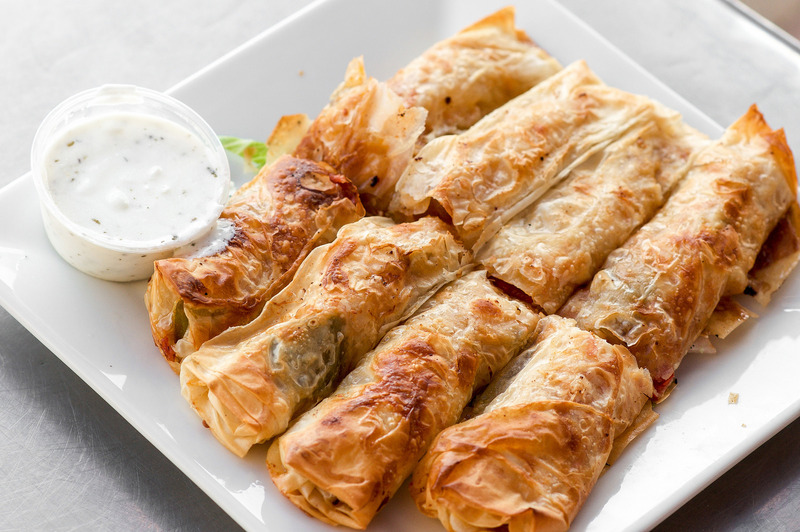 They looked like fat phyllo cigars and were filled with sautéed chicken with onions, red and green bell peppers, fresh spinach and special spices and olive oil. I could eat these all day, for breakfast, lunch, dinner, regular snack and midnight snack. 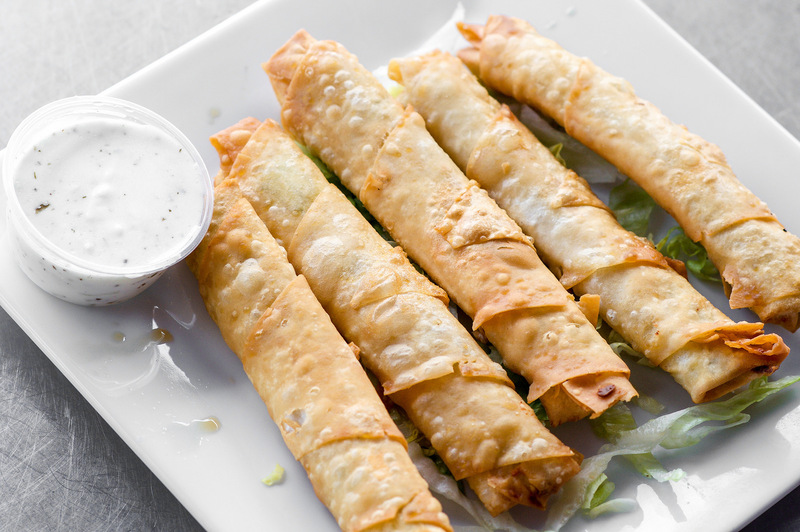 The crunchy exterior combined with the magical chicken filling was nothing short of miraculous. 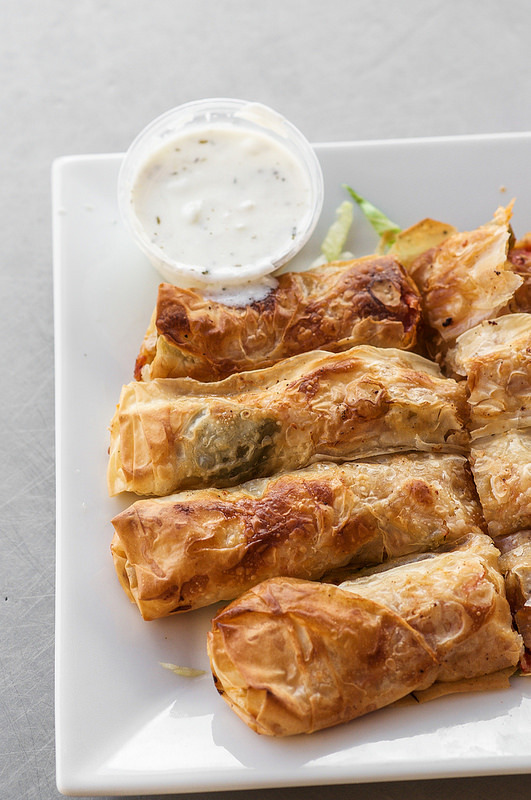 My sister ordered the Sigara Boregi – Extra feta cheese, fresh parsley, rolled with Turkish fillo, cooked very lightly with vegetable oil. These were also delicious. 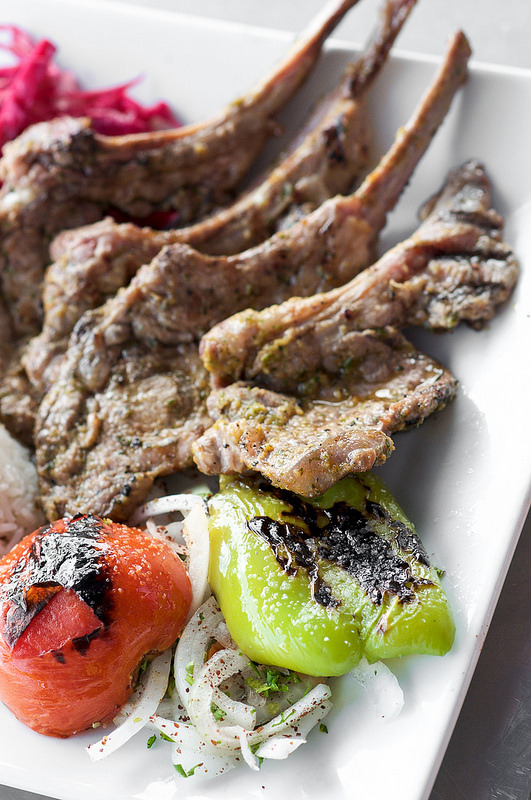 What to say about the Lamb Chops ( Kuzu Pirzola) ? These meaty lollipops were popping with flavor, bringing my carnivorous instincts to the fore. Grilled baby lamb chops were served with slivered onions and rice, grilled green bell peppers, and roasted tomatoes. The chops were so soft, succulent and flavorful. The rice and the rest of the veggies, all eaten in one bite, was certainly a flavor explosion worth savoring. I am not a dessert person, but the Rice Pudding ( Sutlac) was spectacular. 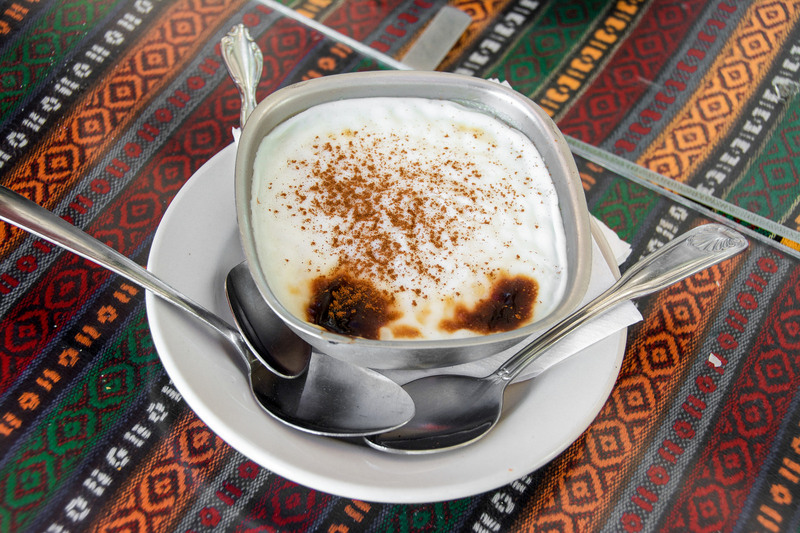 This baked rice pudding served with a generous sprinkling of cinnamon was the epitome of comfort desserts. This will make even a sorrowful person smile with pleasure. The Baklava I did not try, but my sister loved it. 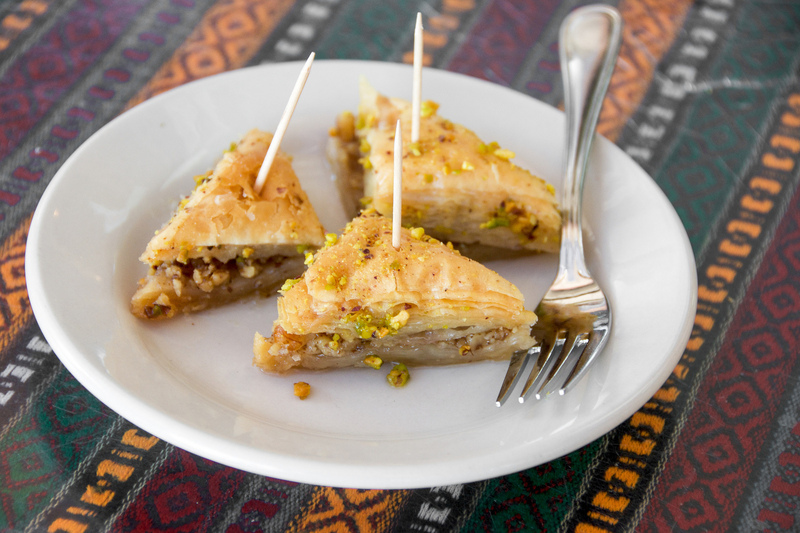 Sweet pastry made of ultra thin fillo dough sheets, layered with chopped nuts, special homemade syrup, and butter, garnished with pistachio nuts. 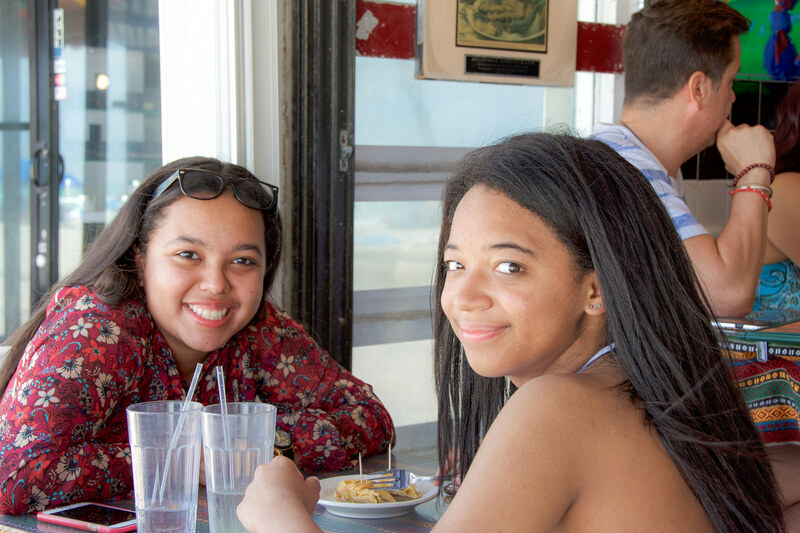 Can you believe that they sat at their own table so the could order from the Kid’s Menu? 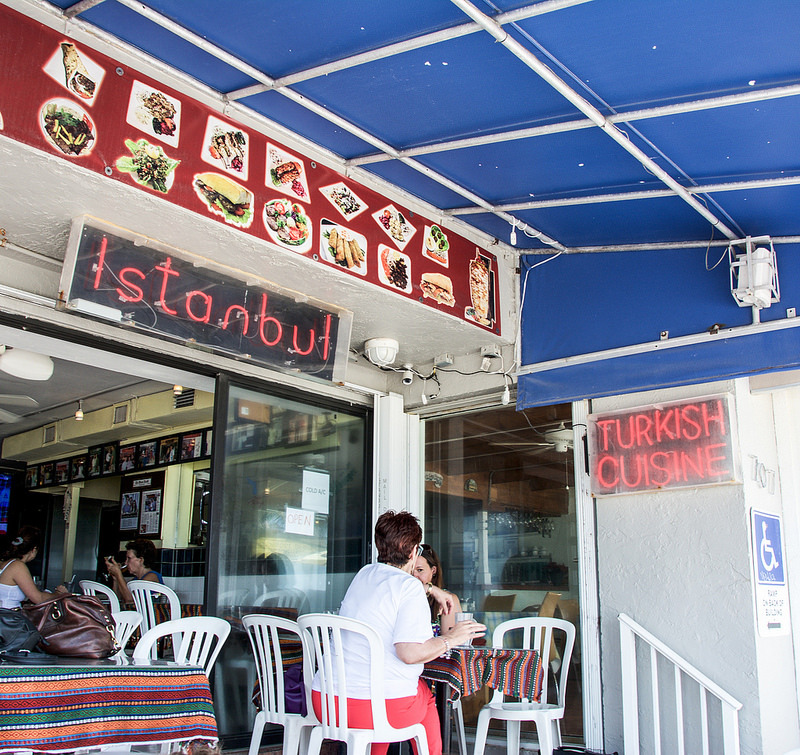 Istanbul Restaurant has been around since 1991 and all the meat served is Halal. 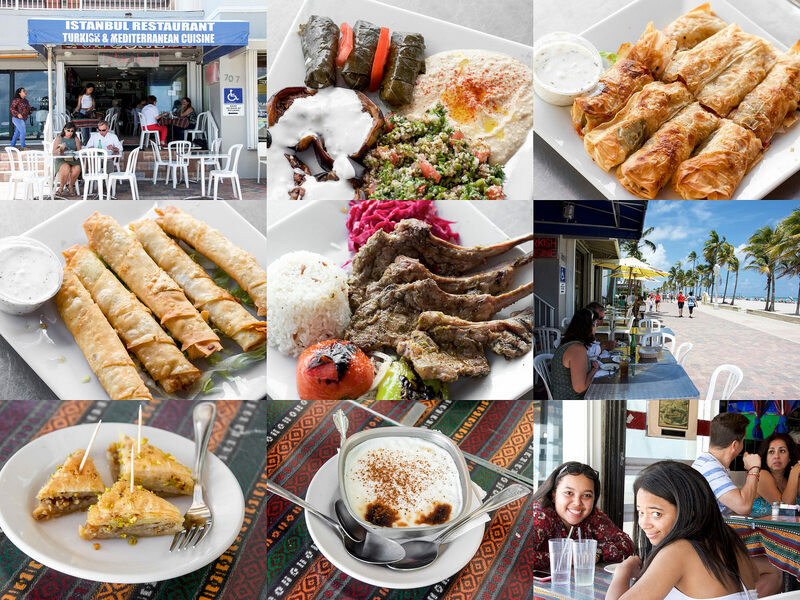 The menu is extensive and offers a variety of authentic Turkish and Mediterranean dishes. 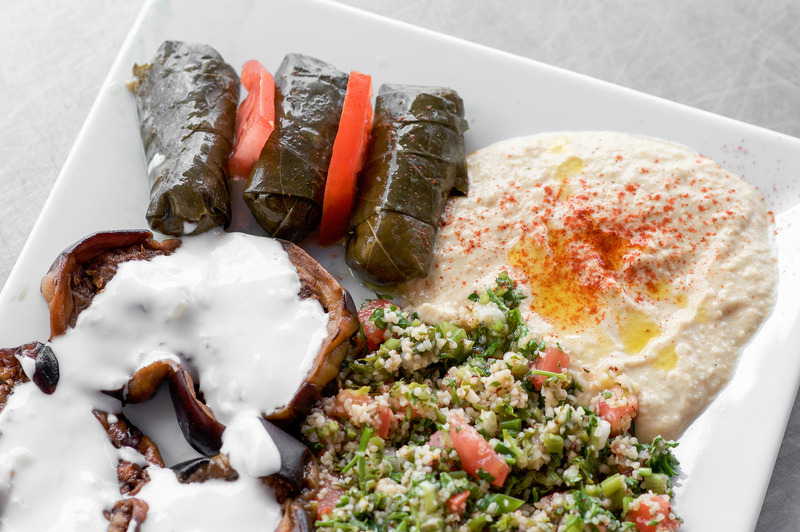 The service is efficient and friendly, and the food we had delivered a flavor-bomb with each bite.